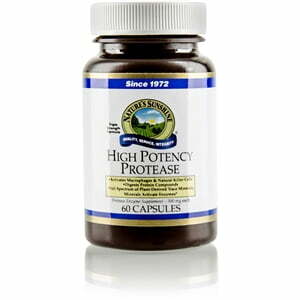 Nature’s Sunshine High-Potency Protease promotes proper protein digestion and absorption of nutrients. Protease, a key enzyme in the digestive process, helps the body break down proteins. 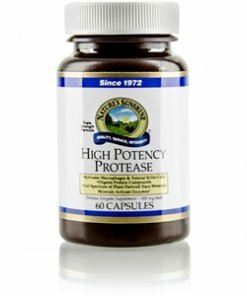 High-Potency Protease assists in digesting high-protein foods as well as breaking down foreign proteins from mucus or arterial health. Protease also provides essential immune and circulatory support. Each capsule equals 3 capsules of Protease Plus and contains 180,000 HUT’s protease. Instructions: Take 1-3 capsules between meals up to three times daily. Trace Mineral concentrate, gelatin, and water.